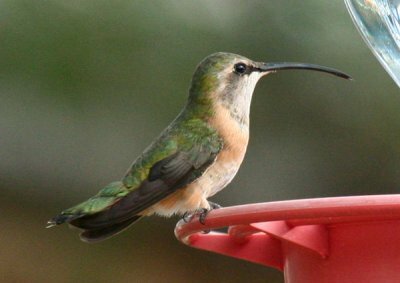 Last Saturday, September 11, Barbara and I went to Southeast Arizona to look for the Plain-capped Starthroat (a hummingbird) that had been reported to be present regularly for the past several days at the Paton’s feeders in Patagonia. We arrived about 4:00 p.m. and no one else was present. 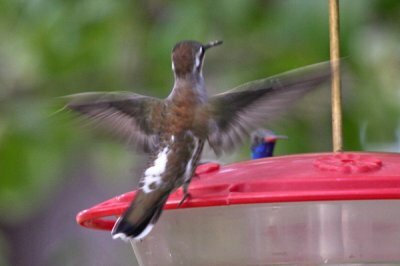 Plenty of hummingbirds, including Black-chinned and Violet-crowned, were buzzing about, busily sipping at the dozen or so hummingbird feeders in the back yard. Mike Marsden, who has assumed a caretaker role at the Paton home, came out to join us, and Al Hodges of Maine also came by. Al was with me on a Wings trip a couple of years ago and it was a pleasant surprise to get together again. As we were visiting, the Plain-capped Starthroat made a brief appearance, and then disappeared for the rest of the evening. Barbara was able to get a couple of quick shots showing the prominent white feathers which provide a reliable field mark for identification of the Starthroat. 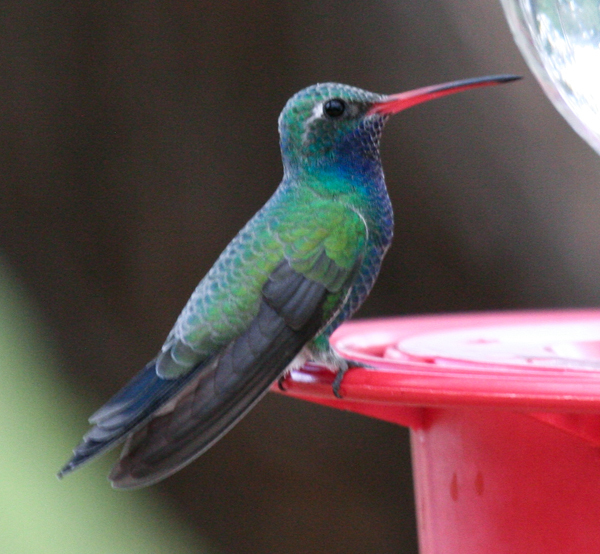 The Starthroat is quite rare in North America. The American Birding Association rates it a 4 on its Checklist, just one shy of the really rare 5s. 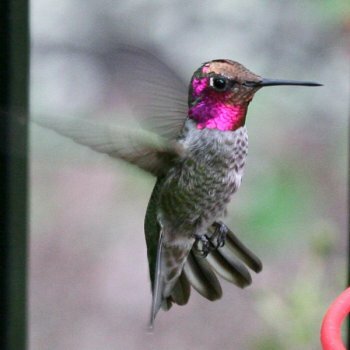 I mentioned that one of my nemesis birds has been the Lucifer Hummingbird, (only a 2 on the ABA Difficulty Checklist) which I have searched for in Texas a couple of times in prior years, with no success. Mike said it should be no problem finding them at Mary Jo’s. Mary Jo is the host of Ash Canyon Bed & Breakfast south of Hereford, AZ. We revised our plan for Sunday and drove to Sierra Vista to find a hotel for the evening. Sunday morning we drove south to Mary Jo’s where we arrived early in the morning to be greeted by a flock of very large and very tame wild turkeys strolling through her yard. We watched the furious hummingbird activity at her feeders for a while. 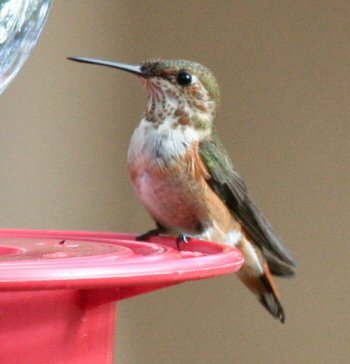 Mary Jo came out and sat with us, and it was not long before both male and female Lucifer Hummingbirds appeared. Yeah!!! Two North American life birds (Nos. 688 and 689) for the trip when I had only expected one. We saw perhaps a half-dozen of them during the morning. She tells us that they have established a significant breeding territory in the easter Huachacas over the past 10 years and that there are about 150 pairs now in the area. Broad-tailed, Magnificent and beautiful Broad-billed hummingbirds passed through the feeder setup, along with innumerable Anna’s. Mary Jo was leaving to spend the morning hummingbirding at a neighboring B&B, Beatty’s in Miller Canyon. 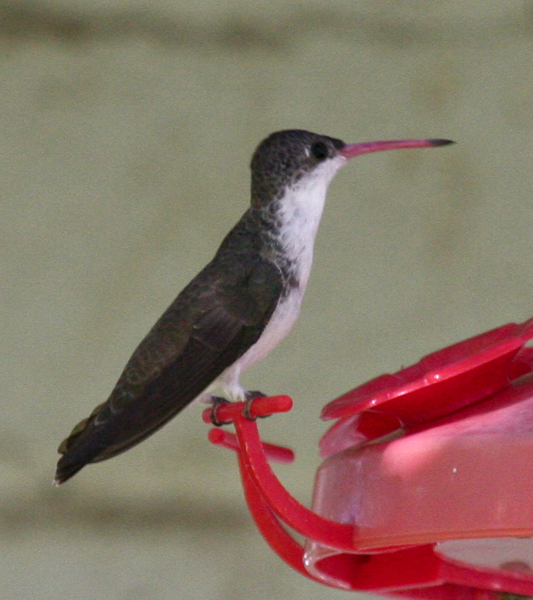 Beatty’s is a bit higher and has some species of hummingbirds that do not show up at Mary Jo’s. 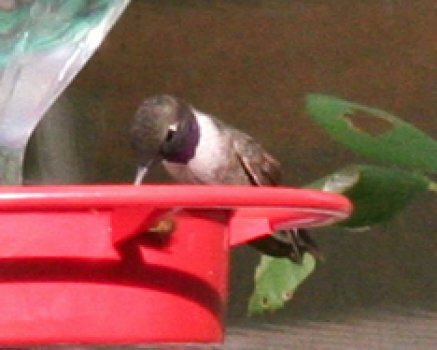 After we had absorbed as much of the hummingbird activity as we cared for at Mary Jo’s (we were hoping for the appearance of a Calliope Hummingbird, which had been seen there once or twice on previous days but not this day), we followed her directions to Beatty’s and were welcomed by the Beatty family. We spent an hour or so in their lovely hummingbird garden where we were able to view several Blue-throated Hummingbirds. 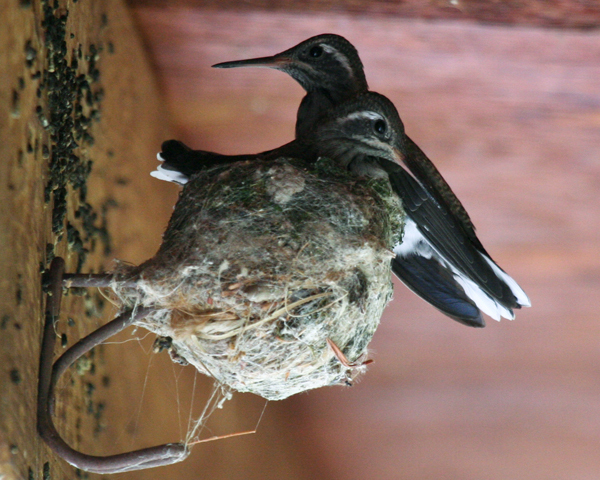 A highlight was a nest with 2 young Blue-throated Hummingbirds nearly ready to fledge. No Berryline Hummingbirds made their appearance, so I will have to wait for a future trip to add that one to my life list. They had been regular at Beatty’s but it is late in the year and they seem to have moved south. We did enjoy seeing several Rufous and Anna’s. That afternoon we drove to the San Pedro House east of Sierra Vista and hiked along the San Pedro River. I think I was stung by a really potent insect during the walk and had some uncomfortable chest congestion for the remainder of the day. We were able to spot a couple of good birds on that walk, including a Blue Grosbeak and a Vermillion Flycatcher. The Rare Bird alerts were going wild last week with the reports of a very rare Cuban Pewee in the Florida Everglades. There have been only 3 prior confirmed sightings of this species in North America. We decided to go try to find it. 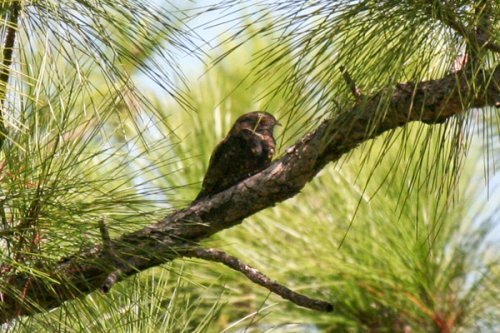 Our search for the Cuban Pewee would be supplemented by the possibility of a Western Spindalis, reported seen on September 6 and 7, in the same general area where the Pewee was being seen. As soon as we arrived at the reported site, an excited birder motioned to us to come up a trail leading into the wooded area near Long Pine Key. 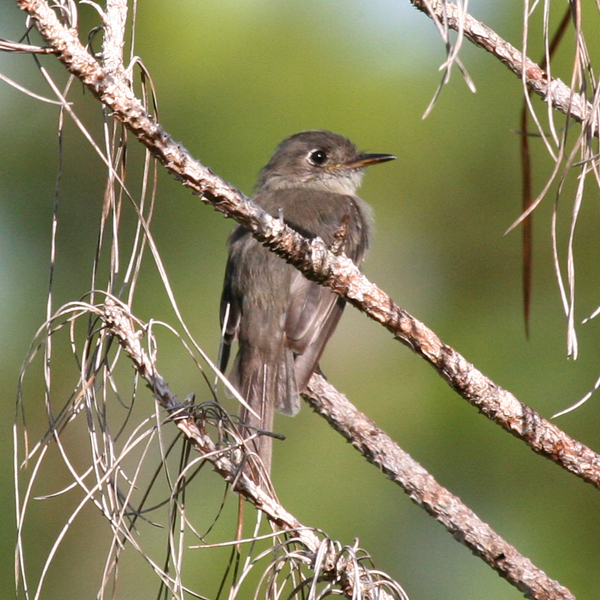 We followed instructions and were rewarded with an immediate view of the Cuban Pewee right above the trail. The light wasn’t very good, but the view was sufficient. However, we decided to try for a better look the next morning. When we returned the next morning there were a dozen or so birders already on site. 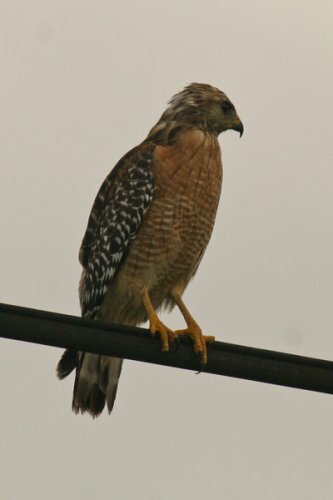 Soon one came running up the road to report the Pewee was perched about a quarter of a mile down the road. Everyone scurried to the location, slightly off the road, and we were all rewarded with terrific, close-up views of the Pewee, in good light. Some of the photographers went annoyingly close to the bird, but he stayed throughout the commotion. Barbara got some good shots from a distance. Although we did not hear the Pewee give its distinctive call, the prominent half crescent behind the eyes, the unusually large bill, the wingbars and the absence of tail-flicking were determinative. After looking at the Pewee for as long as we wished, we moved off to try to find the Spindalis, with no luck. (The Western Spindalis is a relatively new name for what was previously called a Strip-headed Tanager). No one else has reported seeing it after September 7. The “locals” tell us that the Spindalis nested in the vicinity last year and fledged a couple of young. It was kept quiet to avoid any unnecessary nest disturbance by over exuberant birders or photographers, a very good precaution, I might add. While looking for the Spindalis, another birder spotted a Chuck-will’s-widow, primarily a nocturnal bird, perched on a horizontal branch not far from the road. I have never seen this bird before in daylight. 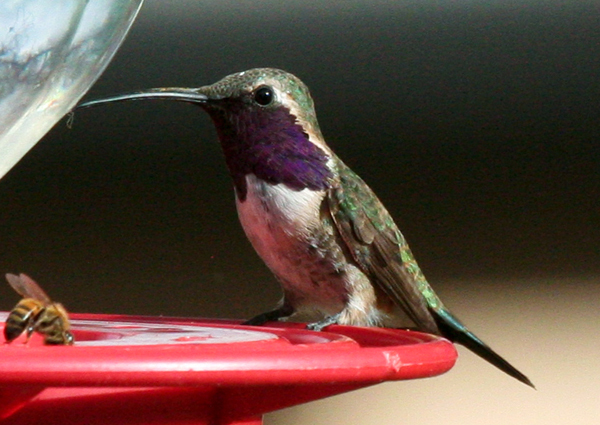 A young couple from Indiana encouraged us to go look for the Plain-capped Starthroat which was being seen regularly in Arizona, so we have deceided to try that sometime. They thought the Starthroat was a much nicer find than the Pewee, but I am sure others would dispute that. Encouraged by attacking mosquitoes, we left the Everglades Park and drove down an old road just outside the Park. Among the sightings there was a nice close-up of a Red-shouldered Hawk. 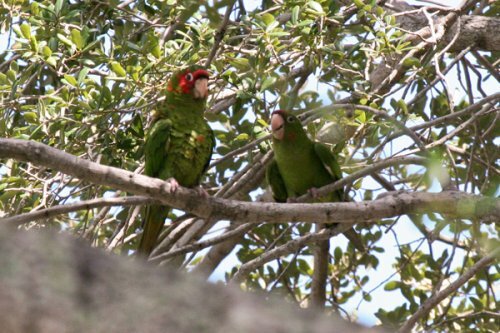 Having exhausted our “must see” list for the Everglades and vicinity, we headed to Miami to try for White-winged Parakeets. No luck on the White-winged Parakeets, but the Baptist Hospital grounds in Kendall were loaded with colorful, noisy Mitred Parakeets.